There are various ways to travel around the world, but when you choose do to it by boat you should follow the lines drawn by Mother Earth. These natural ways are obviously caracterized by the shape of the continents and they follow the dominant winds and currents. Our itinerary was naturally decided according to these caracteristics in order to enjoy the elements at their best, but most of all, it was based upon figures. These statistics have been published by major humanitarian non-governmental organizations (NGOs) such as the World Health Organization (WHO) and the United Nation Children’s Fund (UNICEF) thanks to minor NGOs that have had the courage and the strengh to collect such datas. Painful studies that have been crucial to awaken us to the striking fact that half of World’s population does not have access to clean drinking water. 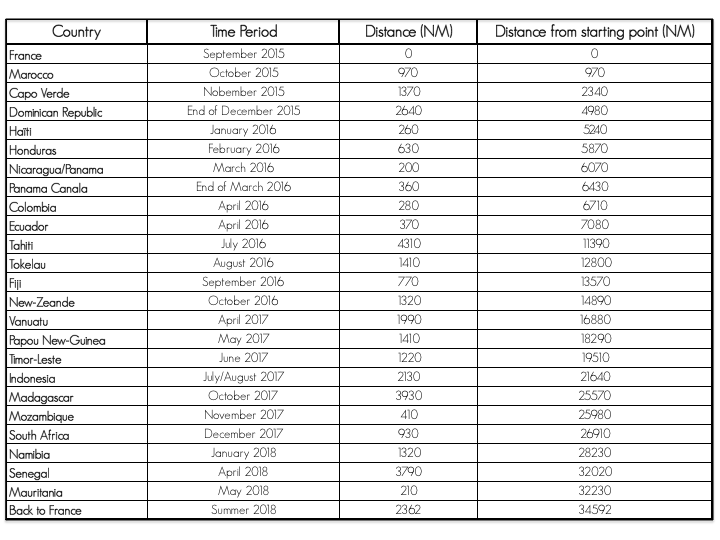 The roadmap’s stopovers correspond to reachable-by-sea countries with most alarming situation. 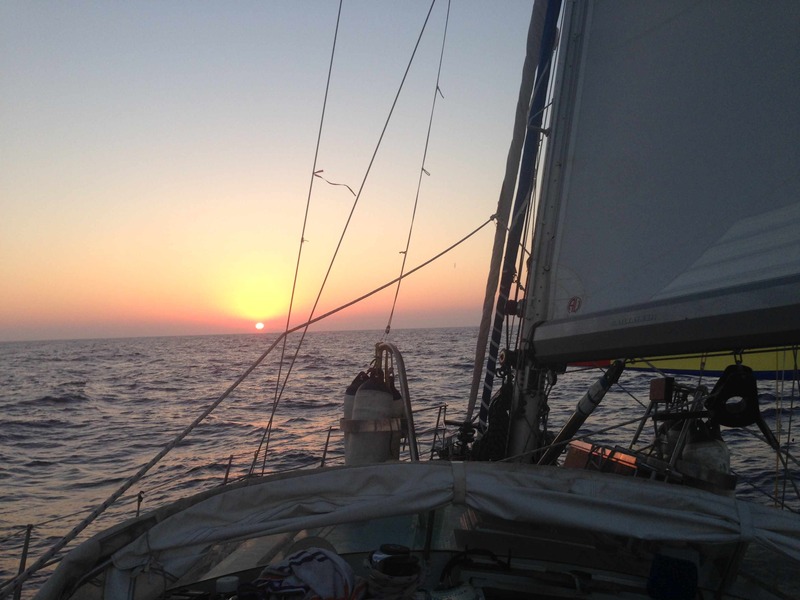 We will set sails from Toulon in the Mediterranean Sea heading South west to reach our first stop: Marocco. Although it is our neighbor, the country is subject to striking inegalities and where unclean water is the cause of many death every year. Then comes the legendary crossing of the Atlantic Ocean, this journey led by Christopher Colombus five centuries ago, giving us a way to Central America, where the access to clean drinking water is very compromised in countries such as Dominican Republic, Haïti, Honduras and Nicaragua. At the end of March 2016, we will sail across the Panama Canal in order to meet the largest ocean on the planet, the Pacific. After the Panama Canal, we will reach the Colombian coasts and head south all the way to Ecuador. Those two countries are known for its lack of proper sanitation facilities and we will intend to help those suffering from the lack of clean water. After a brief stop at the Galapagos Islands we will finally start our journey through the Pacific. Most challenging trip since it will last for over a month with no stopover. May the pacific waters bring us peace, so that, we too, might bring water to the people in need ! Tahiti, Tokelau, Fidji Islands and Vanuatu are on the road and access to clean water everyday is not a relatity for everyone. From November to May, period of the year in the West Pacific and the Indian Ocean with tropical storms which makes the sailing conditions too dangerous, we will have to stop between Fidji Islands and Indonesia. New Zealand happens to be the perfect spot thanks to its high quality shipbuilding facilities, health care services and employment opportunities in case we need to earn some little extra money. Most of all, this long stopover will allow us to review our past work in Central and South America and in the Pacific and to obtain new supplies of filters. In addition, since it is difficult to forecast in details missions two years in advance, opportunity will be taken to get in touch with local NGOs and local authorities of the next targeted countries. Therefore, we will be able to organize our arrival and the amount of assistance required in terms of logistics for the next missions : Oceania ! In March 2017, we will start sailing to Vanuatu with a short stop in New Caledonia. Then, we will reach Papua New Guinea, Timor Leste and Indonesia which have become priority targets for Sail for Water due to huge water access issues. We will sail accross the Indian Ocean during September 2017. Madagascar is known for its unique wildlife and beautiful landscapes, for its joyful population, but also for being one of the poorest country in the world. The need for strong actions is more necessary than ever. Our final itinerary will make us sail along the Eastern and Western coasts of Southern Africa : Mozambique, South Africa and Namibia before heading north to Senegal and Mauritania, and then back to France. In summer 2017, the Williwaw will drop anchor in the harbor of Toulon in the South of France where she will stay at dock until her next take over for more Sail for Water adventures. In total, this is 35 000 nautical across 22 different countries during over a thousand of days. We aim to bring access to clean and safe water to 100 000 persons thanks to the thousand of filters provided.